I make no secret that I think the Coen Brothers (Joel and Ethan) are both overrated and people whose films I generally dislike with one or two exceptions. Inside Llewyn Davis is not going to make me a Coen-Head anytime soon, but at least it was a film I enjoyed for what story it was telling. I don't agree that Inside Llewyn Davis didn't have a plot per se, but I think a good term would be it was freewheelin'. Llewyn Davis (Oscar Isaac) is a highly talented folk singer who has fallen on hard times. His former partner Mike Timlin has committed suicide and as a solo act Llewyn has had no success. If that isn't already bad enough, he is highly unmanageable. He insults his manager and Professor Gorfein and his wife Lillian (Ethan Phillips and Robin Bartlett), the latter two who have been highly kind in letting him crash at their apartment whenever he can't find anyone else who will take him. He can't even watch their cat. Add to this that another folk singer, Jean (Carey Mulligan), with whom Llewyn had a tryst some time back despite her marriage to Jim (Justin Timberlake), is pregnant. She wants a child with Jim, not Llewyn, but she does not know who the father is. With that, she opts for an abortion, which the destitute Llewyn agrees to pay for since another woman went through the same process before. He now attempts to get a gig, and from here Inside Llewyn Davis chronicles his wandering journey, where he manages to record Dear Mr. Kennedy, a song with Jim and Al Cody (Adam Driver), goes to Chicago to perhaps play at a club where his ride, jazz performer Roland Turner (John Goodman) and driver Johnny Five (Garret Hedlund) end up drug-overdosed and arrested respectively, the club owner (F. Murray Abraham) advises him to reunite with his former partner, and despite a quick thought to do so, Llewyn opts not to take a side trip to see the son he thought had been aborted but whom he discovered earlier had not. In desperation, he attempts to rejoin the Merchant Marines but finds this is more trouble than it is worth, reconciles with the Gorfeins, and Inside Llewyn Davis ends where it began: him getting beat up outside an alley. At least when the film ends, we know more. First, we know that the man assaulting him is the husband of the performer Llewyn had mocked prior. Second, we hear that a new folk singer follows Llewyn Davis' set, a fellow named Dylan. 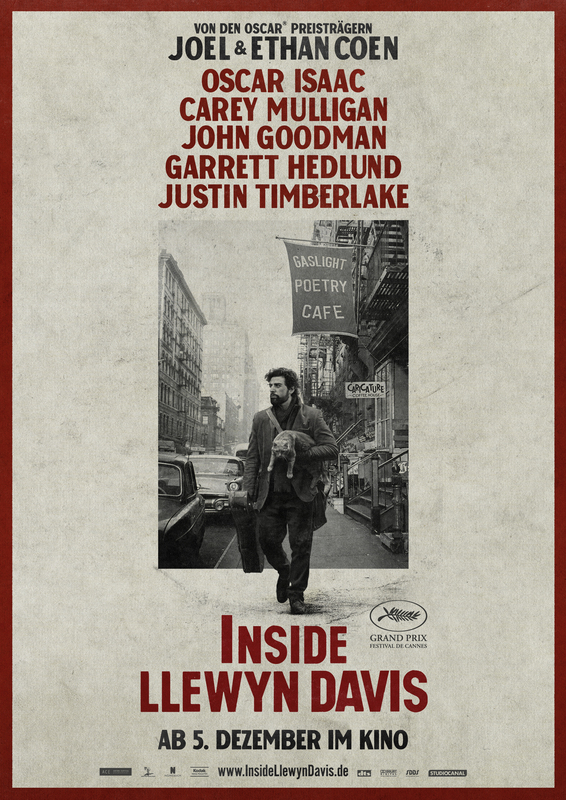 What is good about Inside Llewyn Davis is first and foremost the performances. We end up both liking and disliking Llewyn Davis, a man with talent and something within him to succeed but who is also self-destructive and arrogant. He is quick to dismiss the Gorfeins generosity when it suits him, and who makes one bad choice after another (knocking up Jean, avoiding contact with his unknown child). However, we also see in more quiet moments Llewyn can be someone who is troubled and wants success but is frustrated that despite his talent he can't find his way. Isaac just does wonders with this idiosyncratic character, who is both good and bad, capable of sincerity and really despicable at the same time. Mulligan continues to show her range as the bitter Jean. I'd say that perhaps her character has one mode (angry) but she does rattle off great lines like how Llewyn is like King Midas' idiot brother, everything he touches turns to mud. I also thought well of Stark Sands' naïve folk-singing soldier Troy and Driver's Al Cody. Granted, they kind of rambled out of the film, but given the more open nature of Inside Llewyn Davis I didn't object. Goodman, a Coen Brothers veteran, was great as the blunt Mr. Turner (and perhaps not intentional, reminded me of Dr. John). I generally don't think all that much of Hedlund, but he did well as Johnny, and even Timberlake (he is not an actor yet) came across well as the somewhat clueless Jim. As for the music, as someone who loves Dylan and folk music in general (who doesn't like Mumford and Sons? ), the music made me almost want to get the soundtrack. I figured Dear Mr. Kennedy was meant to be comically idiotic, but there are also other songs, like Five Hundred Miles and Hang Me, Oh Hang Me that are really beautiful and well-performed by Timberlake, Mulligan, and Isaac. Perhaps that is one thing that kept me from finding Inside Llewyn Davis a major Coen Brothers film. People came and went, and while that was the intent I can't say I was overwhelmed by it. One aspect I disliked intensely was Bruno Delbonnel's cinematography. Perhaps it was my screener, but so much of the film looked so dark I sometimes had a hard time making things out. However, I don't think this was by accident, which leaves me a bit cold. That is a big thing, the fact that Inside Llewyn Davis was opaque. However, I found that the film was if not a love letter to folk music, it was a good portrait of someone with talent on stage but no real control off. Coen-Heads will like the film, and those like me who are more hostile to their work will find much to enjoy.